It is refreshing to see talented artists that are willing to leave their egos at home and give the limelight to others, which is the case with Chris James and Patrick Rynn’s latest album, Barrelhouse Stomp. This disc is a celebration of that uniquely American hard-driving genre, and it features three fabulous blues pianists that each get a shot at taking the lead role. This San Diego-based pair have worked together for 24 years, but they have not adapted to their laid-back Southern California surroundings and they continue to crank out righteous Chicago electric blues. James is the vocalist and lead guitarist and Rynn handles the bass chores, just as they have with the Blue Four and all the other bands and artists they have worked with. Barrelhouse Stomp is the Blues Blast Magazine Award-winning duo’s third effort for Chicago’s Earwig Music label and you will not find a bad track amongst the 12 tunes on this CD. Actually, that is an understatement -- these are all very good songs! They took their time making this album, as it was cut between 2009 and 2011 in Chicago and Arizona, and it includes the work of 11 extra-fine musicians, some of who are unfortunately no longer with us. The featured pianists are Henry Gray, David Maxwell, and the late Aaron Moore; you may remember that Gray and Maxwell also appeared on their previous album, Gonna Boogie Anyway. They also brought in a trio of heavy-hitting tenor sax players: Norbert W. Johnson, Eddie Shaw and Johnny Viau. This disc kicks off with “Goodbye, Later for You” which was penned by James and Rynn along with their long-time buddy and harmonica player, Rob Stone. This trio also wrote six other originals for this release. This song is straightforward post-war Chicago blues that highlights Stone’s harmonica and David Maxwell’s piano. Stone and James each take a solo break in between the throaty verses, and though he does not get a solo Maxwell’s keys do not get lost in the mix as he fill the spaces in between. “Just Another Kick in the Teeth” is full of tasty bass work, including a rare solo from Rynn. All three horn players participate in this one giving it an extra-funky vibe and a 1970s feel. James vocals are strong (as they are on the rest of the album), and his phrasing and feel are spot on. He has soul to spare and his years of experience are readily apparent, making him the perfect front man! The first of two instrumentals, “Messin’ with the White Lightnin’,” is one of the standout tracks on Barrelhouse Stomp. This frenzied piece needed an extra guitarist so they brought in the venerable Jody Williams to help out. The guitar work of both men here is spectacular, as is Patrick Rynn’s hand-crampingly unrelenting bass line. David Maxwell keeps his right hand just as busy on the piano all the way through, not to mention his killer solo break that end up being the best 90 seconds of the album. By the way, Chicagoan Willie Hayes fills in behind the skins and does a first-rate job of keeping the beat going. “Take it Easy” is a sweet tribute to the late Pinetop Perkins, and David Maxwell is tasked with honoring this legendary pianist. They clear the stage for this driving boogie and put the piano up front, giving Maxwell the chance to prove himself and, (as always) he does not disappoint. The backline is tight and James plays an aggressive rhythm guitar that he uses to set the playful mood. The cover tunes were well-chosen, and include gems such as Big Bill Broonzy’s 1941 tune, “I Feel So Good,” boogie-woogie legend Little Brother Montgomery’s “Vicksburg Blues” and Elmore James’ classic favorite, “Bobby’s Rock.” Of these, ”I Feel So Good” is the big winner as all the pieces come together splendidly, including Aaron Moore on piano, plenty of gloriously raunchy sax from Johnny Viau, and the late blues virtuoso Willie “Big Eyes” Smith behind the drum kit. Appropriately, the album comes to a close with one last original tune, “Last Call Woogie” that features Henry Gray on piano plus Viau and Johnson on sax. Eddie Kobek’s tom-heavy drums and creative use of silence lend this song an Afro-Cuban/Latin feel and James’ vocals are out front and edgy as hell. The lyrics are perfectly suited for the last song of the set, plus it is cool to end the album on an upbeat note. 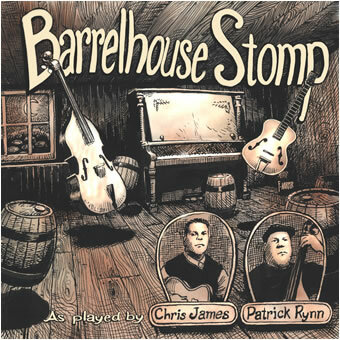 If you are not a fan of Chris James and Patrick Rynn, you will be after just one listen of Barrelhouse Stomp. Their refreshing take on an old genre, their tight groove and high production standards (not to mention their cadre of talented friends) will guarantee that their music will stick in your mind make you want to give it another turn. Check it out if you get a chance!